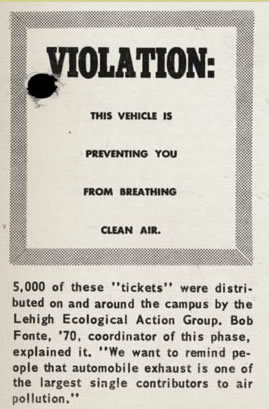 Air pollution was a concern at Lehigh in the 1970s, prompting environmental action on campus. From the Brown and White, February 13th, 1970. In the 1960s and 1970s there was a tremendous explosion of works on the environment. From overpopulation to DDT and its effects on wildlife, people became increasingly concerned with mankind's impact on the environment. Efforts to protect the environment culminated in the passing of major federal legislation in these decades. The National Environmental Policy Act of 1969-1970, for example, resulted in the creation of the Environmental Protection Agency. Environmental writing and action since the 1970s has transformed the way people interact with the world around them. Recycling, sustainability, "clean" or alternative fuels, and organic foods are just parts of a larger movement to live more carefully on the earth, and to protect natural resources. The books displayed here are just a sampling of some of the influential environmental works written in the 1960s and beyond.